To educate and to preserve the history of the pioneers of our Country and the part that the people of Irish descent have contributed to the development of the United States, Canada and Ireland. 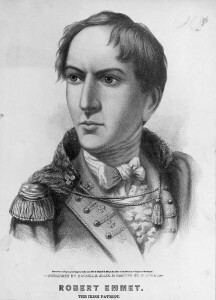 The Friendly Sons of Saint Patrick grew out of the Robert Emmet Club. The latter club was formed in 1941 and founded in the name of the Irish patriot who was hanged for treason in 1803. Emmet was the leader of an ill-fated rising against British rule in Ireland. The Robert Emmet Club was established primarily as a social gathering place to bring together men who shared pride in a common heritage. In 1955 the name of the club was changed by consensus to its present form, the Friendly Sons of Saint Patrick of New Bedford, with an incorporated constitution and bylaws. The Friendly Sons held their first function in March 1956; a dinner dance in honor of the feast of Saint Patrick. Today, while the Saint Patrick’s Day dinner dance remains a centerpiece of the annual social calendar of the association, the club hosts many functions and charitable events throughout the year. Members gather monthly, except during the summer months, to conduct the business of the club in accordance with its stated objectives. The club does not maintain its own dedicated premises for these meetings at this time. 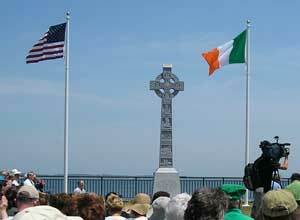 The lives and the contributions of the Irish to the City of New Bedford are celebrated by an imposing and symbolic monument in the form of a Celtic cross by the water’s edge at the mouth of New Bedford harbor. The monument, dedicated on 24 June 2005, was designed and is located quite intentionally. Although the form of the Celtic cross predates the arrival of Christianity in Ireland in about 432 a.d. this particular memorial is designed to represent the deeply-seated faith and beliefs that anchor the culture and emotions of the Irish. The symbols and pictorial panels on the monument commemorate the historical contributions of Irish and Irish-American people to the Greater New Bedford area and among the Friendly Sons. The symbolism extends also to the location of the monument at the water’s edge. Its placement recognizes the emotional, cultural and economic odyssey of those who gave up their homes to seek a new and better life on the shores of North America. It celebrates the livelihood and success many achieved as they plied their trade locally and often even on these very waters. 1960-61 Edward L. Manley, Jr.
1961-62 Edward L. Manley, Jr.
1993-94 James E. Sullivan, Jr.
1994-95 James E. Sullivan, Jr.